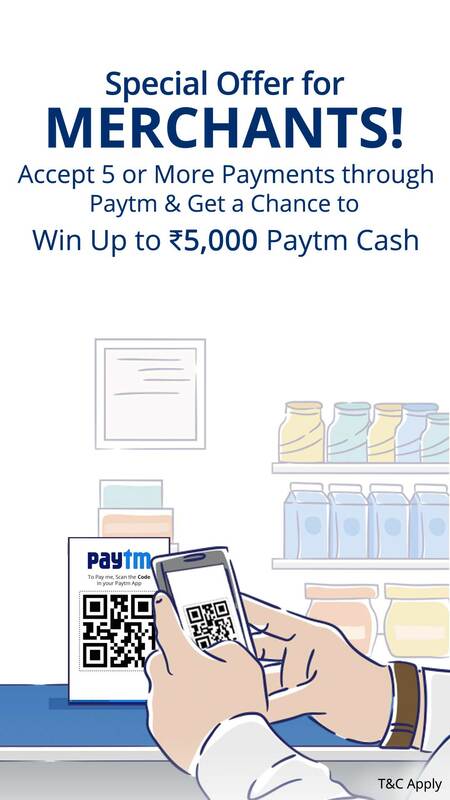 Merchant needs to accept 5 or more payments through Paytm from their customer & they will get a chance to win upto Rs. 5,000 Paytm Cash. Upto Rs. 5000 Paytm Cash. * Only payments which are of a value equal to or more than Rs. 20/- (Rupees Twenty Only) shall be considered for the purposes of this offer. * Only payments made by unique customers shall be considered. * Merchants who fulfill the above criteria will form part of the eligibility pool and then the lucky winners shall be chosen on a random basis. * Winners will get up to Rs. 5000 Paytm Cash. * Merchant who has won Paytm Cash once, will not be eligible to win it again in this offer. * Paytm cash will be credited in the winner s registered Paytm Wallet within 48 hours, once the winner's list for the day has been prepared.